New Year… New menus! Our Winter Menu launches in January offering seasonal twists, with nourishing and wholesome dishes available throughout the day. 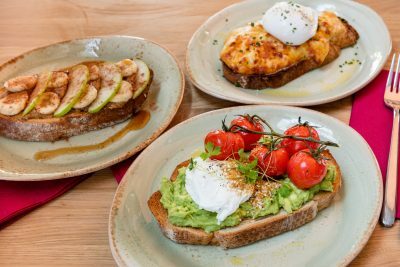 We welcome ‘Almond butter, apple, banana with cinnamon and maple syrup’ to our range of Posh Toasts – a selection of simple, mouth-watering toppings on grilled sourdough, with gluten-free bread now also available. 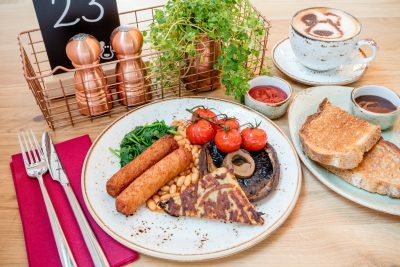 To partner our popular Hearing Dogs full English breakfast, we have introduced a healthy vegan cooked breakfast alternative which includes vegan sausages, spinach, grilled flat mushrooms, vine tomatoes and hash brown. 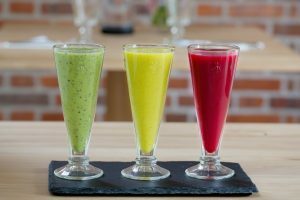 Kick-start your day with a vitamin-packed smoothie, choosing from our vegan ‘Green Machine’ (kale, melon, cucumber and mint), ‘Root Around’ (beetroot, apple and ginger) or ‘Carrot and Stick’ (carrot, ginger and turmeric). Or, for the slightly sweeter tooth, we offer a luscious non-vegan ‘Top Banana’ brimming with banana, strawberry and yoghurt. For those joining us after midday, our lunch menu offers more temptations. 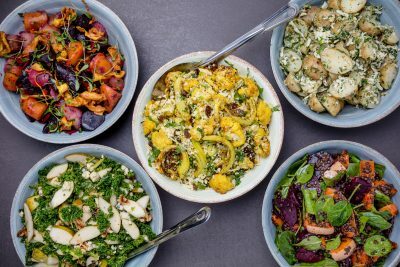 Our brand new salads include the wholesome ‘Kaledorf salad’ with kale, Stilton and pears, or plant-based vegan salads including roasted spiced cauliflower, roasted beetroot and butternut squash with beluga lentils, or Heritage carrot with a tasty chilli dressing. Compliment your salads with a protein boost including the vegan House falafel, simple grilled organic chicken or poached salmon. Our customers continue to love The Grange fish pie (gluten-free), and we have introduced hearty and warming Braised West Country ox cheek and locally brewed Rebellion Ale beer-battered hake and chips. 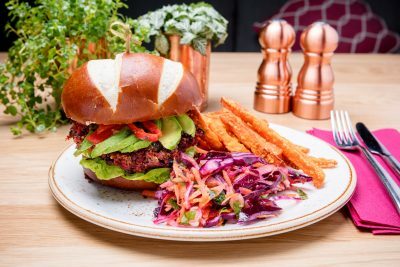 Our generous Pretzel burger is now partnered with a vegan alternative, the spiced beetroot, quinoa and bean burger served with avocado, slaw salad and fries. 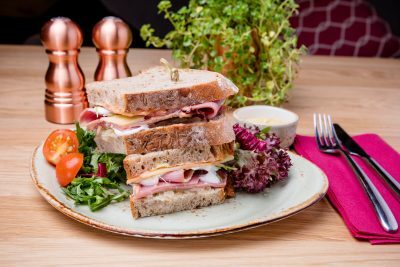 We have completely refreshed our range of Panini, Deli Sandwich and Baked Potato fillings to include some exciting new options, such as pesto halloumi, Reubens salt beef with sauerkraut and BBQ pulled jackfruit. 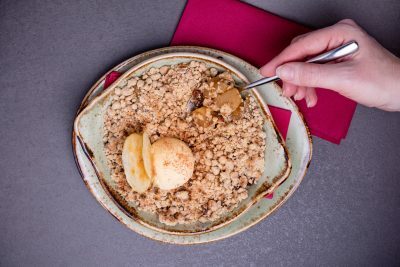 And for a sweeter treat, why not try the gluten-free spiced pear and apple oat and almond crumble served with a clotted cream ice cream? Or just pop by and relax with a freshly brewed coffee or pot of tea, accompanied by a mouth-watering cake, like the new orange and polenta cake, or vegan walnut and orange brownie. Whatever whets your appetite, you can look forward to a warm welcome at The Grange this winter! Check out our new seasonal Winter menus here.